15.5' Max Trax scale 1/64 1000' track with 6' shutdown including dynamic braking, steel stop strips, and catch box. Two 30 amp 0-30 volt power supplies, one for each lane. 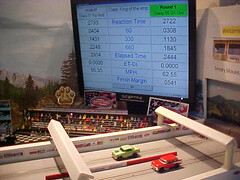 Track Mate timing system with reaction, 60, 330, 660, finish ET and MPH readings. Timed section is 1/64th scale 1000ft ( 15' 7" ) w/ 3ft of shutdown into pillow box. Max Trax track surface. Double wide track utilizing two outer lanes for racing. 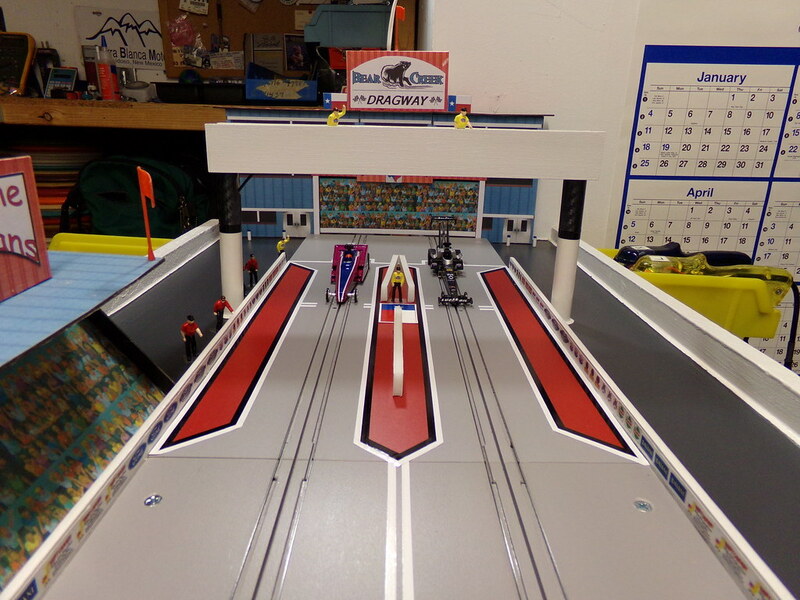 Timed section is 1/64th scale 1000ft ( 15' 7" ) w/ 7ft of shutdown into pillow box. Tomy AFX plastic sectioned track surface. Double wide track utilizing two outer lanes for racing.